Unfortunately I have to confirm that Phil Lambert has proffered his resignation from the role of Chairman of the Hertfordshire Archery Association. He and his wife are moving to Shropshire in the next few weeks. Phil has certainly embodied this motto of our sport’s governing body. His contribution to the Association has been immense on many levels. As well as his personal participation as a county team archer, he trained to County Coach level and gave his time to assisting archers from many clubs and regularly attending the winter squad meetings. He has been County Chairman for many years, bringing his fairness and open attitude to many situations. More recently he has been the Treasurer of the Herts Group of Archery Coaches. He will be greatly missed, in ALL these capacities, as well as for his bonhomie and support for his colleagues. Meetings will not be same without his humour, even the bad jokes! I know that you will join me in wishing Sue and Phil a very happy future in their new home and county. The 2015 County & Open Championships were held for the first time at Jobbers Wood near Bishop’s Stortford, an excellent venue, the only downside to a perfect shooting day was the very strong wind which some archers found slightly off putting. As a result only one archer managed to register the full 144 scoring arrows, so that does give you an idea of the conditions. Despite losing a couple of County Archers to other events ( How did you all do? Please let us know?) and pre booked holidays it was heartening to see so many Championship virgins, and even some York/Hereford ones to. With such a strong wind all day it did mean that shooting was a bit slower than one would normally expect, all I can say is, be grateful you didn’t have timed ends. And many of you looked how I felt at the end but it did stay dry as I managed to divert not one but two rather dark cloud formations around the field rather than over it. The results have been sent out, the field returned to its owner, so now is a good time to think about next year when we hope to be able to return to our regular slot. Anyone with a suitable venue? Anyone like to have a go at running the event? Don’t put it off, just let your County rep. know. Thank you to everyone who contributed to making the day so enjoyable. Neil Bridgewater and David Wayman two of Hinxworth Archery Club’s top compound archers were invited to take part in the U.K. Masters Championships at Lilleshall National Sports Centre near Telford over the weekend of the 6th/7th June. 140 of the U.K.’s highest ranked archers were chosen to compete in what is regarded as Britain’s premier Archery Event including our own Neil Bridgewater the reigning 2014 compound champion and clubmate David Wayman. The compound category for men consisted of the top 35 gentlemen compound archers in the U.K.
At the end of the first day Neil led the field in top spot eliminating all of his opponents in the head to head. David finished in a very accomplished 6th place making Hinxworth A.C. the only club with both members in the top 10. The final on Sunday 7th June was the Individual Championship with all participants shooting 36 arrows at each distance 90m/70m/50m and 30m a total of 144 arrows each. Neil again emerged as the clear winner and double gold medallist. David finished with a respectable 11th place overall in his very first U.K. Masters tournament. 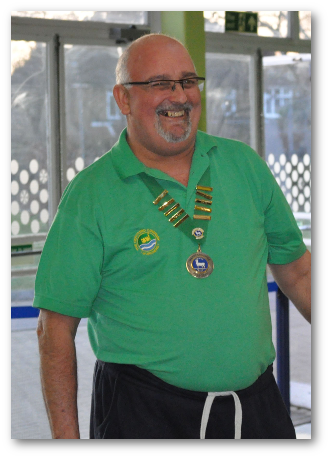 It is with great sadness that I have to inform you of the recent death of past President of the Hertfordshire Archery Association Mr. Steve Dutch. Steve was a member of Hertford Company of Archers since 1992 and for many years a County Archer and active supporter of all County events. All those who knew him will have their own personal memories but one must include his individual way of tuning an archer’s recurve bow. On numerous occasions when I first progressed to the county squad Steve would find it almost impossible to leave me to shoot my noisy bow without just walking up to me, taking my bow, fiddling with something and then handing it back with a, try that comment, it always worked but I never knew what he did. I must admit that for many years Steve was my nemesis, I could get so close to beating him in competition but so often he ended up a point ahead, I’m sure he did it on purpose and let me get that close. To Lyn and family, we send our prayers and heartfelt thoughts at this time. Please contact your club secretary for details of his funeral service.